The ItaliaBRAVA professional dryer powered by breathtakingly innovative brushless motor technology, guaranteed to last 10x longer than your regular dryer. 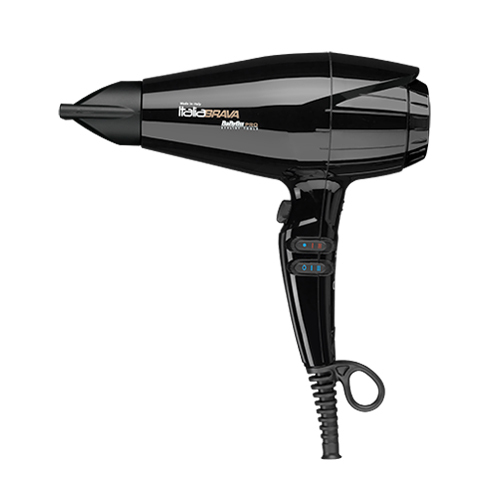 The 2400W Ferrari designed engine gives stronger air pressure and 15% faster*, more concentrated airflow for remarkably smooth and precise, high-speed blow-drying results. Revolutionary Ferrari designed MaxLife™ PRO brushless engine technology uses magnets to drive power lasting up to 10x longer than regular carbon brush motors for up to 10,000 hours of high-speed drying. With an ultra-lightweight design compared to other AC professional dryers, this exceptional dryer promises outstanding results with stronger air pressure, 15% faster airflow, quieter operation and ultimate shine.